Recreated these super cute earrings for the summer. 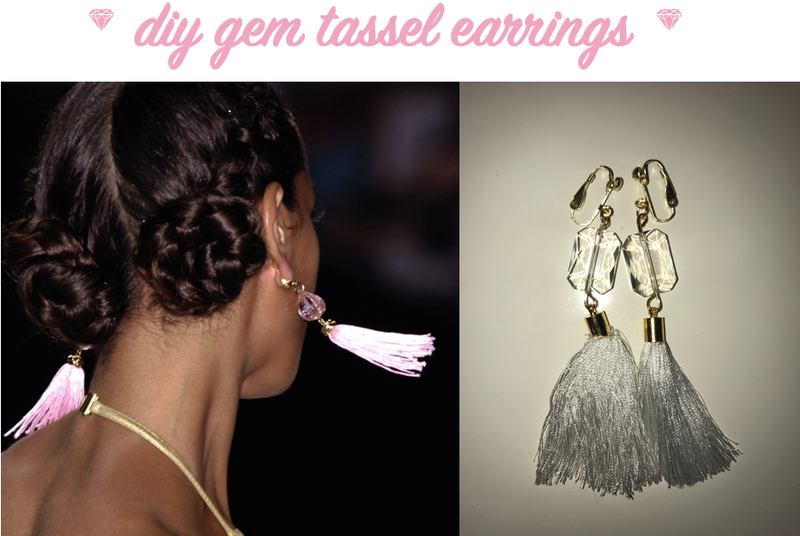 *Although my tassels are already pre-made, I will post a tutorial on how to make your own tassels below the earrings tutorial. 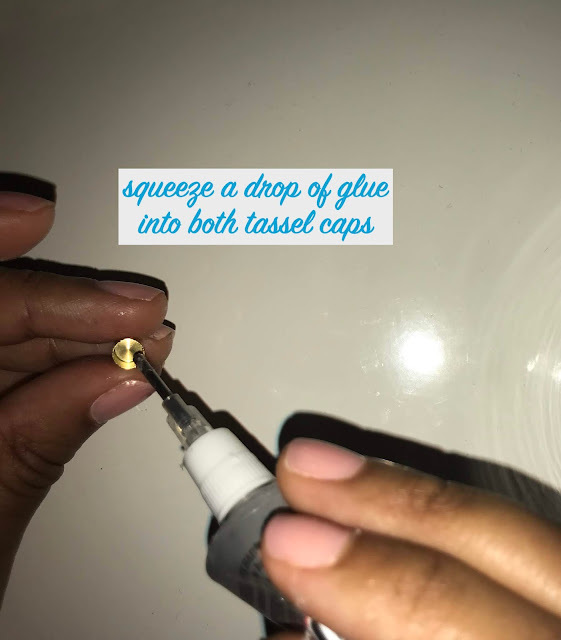 1) Squeeze a drop of glue into both tassel end caps and then push each tassel into the caps. Use the round nose pliers to push them down further. Snip any uneven threads. 2) Using the side cutter, cut two 4-inch pieces of gold wire. 3) Slide one gem bead onto the gold wire and then use the round nose pliers to curl up the bottom of the wire. 4) Attach the tassel to end bottom end of the wire and close the curl using both the round nose and the straight nose pliers. *Here is where you can add an optional jump ring at the end of the wire and then attach the tassel to the jump ring. 5) Cut off most of the remaining wire with the side cutter, leave enough wire to curl it into a ring. 6) Open a jump ring with both bent nose and straight nose pliers and attach it to the top of the earring. 7) Make sure the hoop on the clip on earring back is closed first before attaching the earring to it. Once you attach the jump ring to the earring hoop secure it with pliers. 8) Follow the same steps to make the other earring. 1) Wrap the thread around the cardboard, not too tightly. The more you wrap the fuller the tassel. 2) Cut the thread at the vertical end of the loop. 3) Carefully slide off the threads and hold them together, make sure the loop stays open. 4) Cut off a piece of thread and slide it through the loop. Double tie this thread on top of the tassel. 5) Cut another piece off to wrap around the tassel horizontally, double tie this thread on the tassel. 6) Snip off remaining thread and trim. 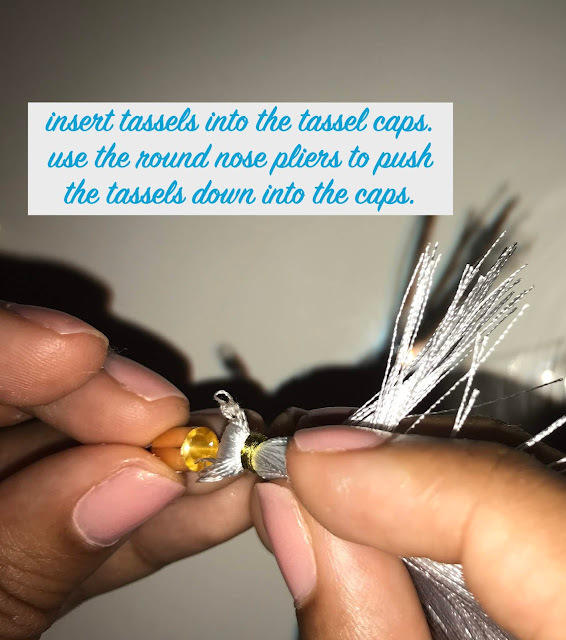 You can place the tassel into the end cap after these steps and follow the steps for the earrings above. another fashion diy coming soon!